I’m sure you’re wondering… Why brains? Well, I’m a brain geek. 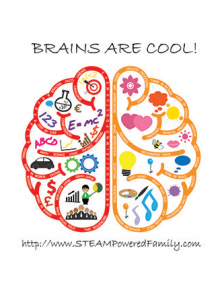 Thinking, processing, storing, controlling… I love brains and learning all about how this tricky organ works. My degree is a BSc in Psychology specialization, which means my major and minor were in Psychology. I really just couldn’t get enough of brains. In fact, they couldn’t get rid of me and after graduation I spent two years working as a research assistant at the University. Since my youngest son joined our family I have returned to my study of the brain, taking courses, researching and meeting with many professionals. My geek heart gets all fluttery when I get to talk about what’s going on between our ears. When I started this website I picked all the popular topics that I knew I would enjoy writing about, but the one thing I wasn’t sure about was brains. I mean beyond any zombie’s who happen to stumble across my blog, how many people are really interested in brains? In the end I decided to add in this category. Brains are my thing. My kids have fascinating brains. I love learning and talking about brains. I want to learn more and I want others to have a better understanding of brains. It’s all quite meta when you think about it. Thinking about thinking. But I hope you enjoy these little discussions and will jump in with your own thoughts and experiences. And if you don’t like brains, it’s all cool, I have lots of other fantastic categories where we can hang out together!